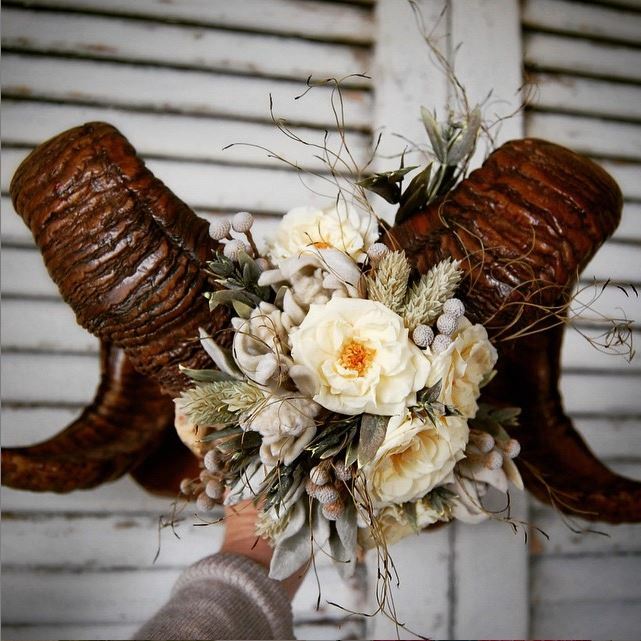 What started as a whimsical desire to enhance a set of ram horns that had been in my husband’s family for years using preserved flowers that I had on hand at the time revealed a chance to have a deeper relationship with our natural surroundings. Starting with a barren, stark template such as mounted skulls and horns, then adding a delicate mix of florals, allows for a full and balanced design that brings forth much more than a conversation piece. By handcrafting each design using materials only found in nature, each production serves as a reminder of the connection that we have with nature. All skulls are ethically sourced. No animals have been killed by me or by others for the purpose of my art. The majority of the skulls I use are sourced by various property owners, farmers, and ranchers who find the animals on or in close proximity to their land and that have died from natural deaths, such as food chain kills, lightning strikes, car deaths, etc. Often found in various stages of decomposition, the skulls would normally be thrown away or left to disintegrate back into the earth. I devote many hours of my time to the restoration of the skulls, breathing new life into these forgotten relics, transforming them from total decay into objects of uncommon beauty.